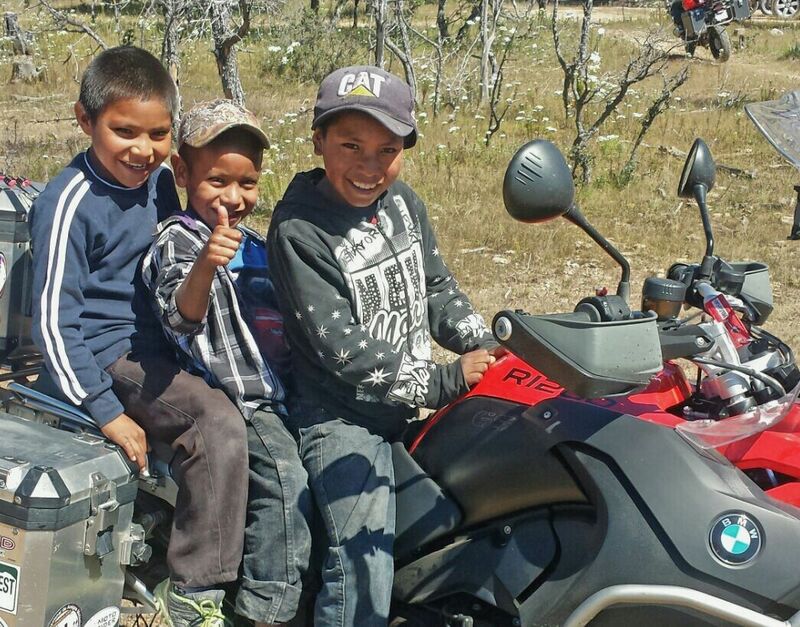 Mention motorcycle travel in Mexico and it seems to elicit one of three responses from riders. The first response is the question, “Is it safe?” The second is a resounding, “When do we go?” Third and most disappointing is an ignorant blathering of, “They don’t speak English there, and I’m not leaving the USA.” Fortunately, most riders fall into one of the first two responses. Those experienced in Mexico motorcycle travel know that riding in Mexico is a rewarding and exhilarating experience. 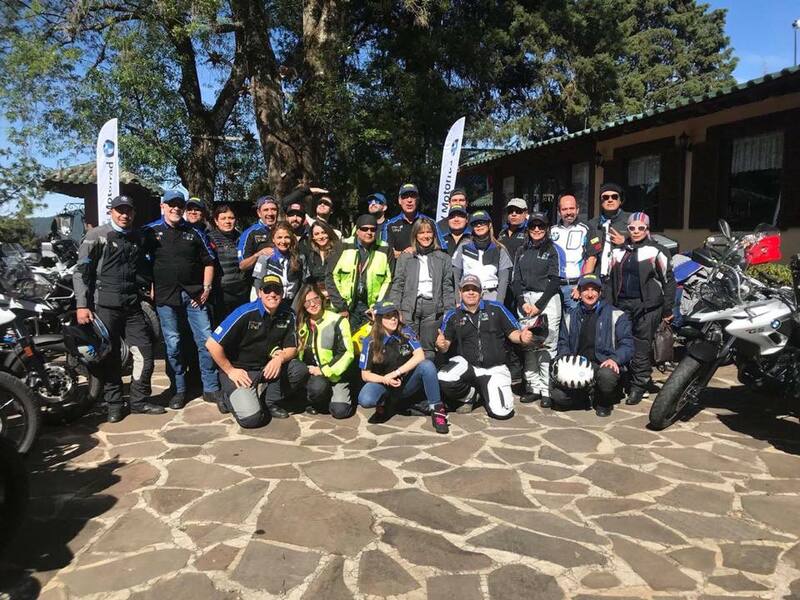 Since 2016, it’s been a sheer pleasure leading groups of riders deep into mainland Mexico to attend the annual Mexico Motorrad Federation’s yearly convention. Along with the convention and all of its excitement, the group gets to experience Real Mexico. Real Mexico is far different than what the cable news cycle portrays. Let’s be honest with each other. We all know that the news media (CNN, MSNBC, Fox News, ABC, NBC, and CBS) seeks to keep its viewers angry, afraid, and misinformed. That’s how they keep you watching. As motorcyclists, we know to shun the doom and gloom. Since we experience it ourselves, we should know better . This understanding enables us to withstand dumb retellings of what nurses call us. We know the news media distorts and exaggerates reality about motorcycles and motorcycling. Why then do we succumb to the fear mongers and propagandists about other topics including Mexico? Those that know from experience are quick to proclaim Mexico’s virtues. There are hundreds of destinations, throughout the country, that are one-of-a-kind and well worth a visit. Mexico is a vast and diverse country. One can travel for months in Mexico and still not experience all the incredible wonders and places. Traveling by motorcycle in Mexico is the single best way to prepare to ride anywhere in the world. Is Mexico for everyone? The answer is, “No.” If one is intolerant, smug, feels superior, or obsesses over politics or the news, that person should stay right at home, alone. These are all indicators of a closed mind and an unwillingness to be objective. Instead, let’s talk about all the reasons why one SHOULD ride their motorcycle to Mexico. In particular, why you should go to the XXIII International Convention happening in Chihuahua, October 2-6, 2019. 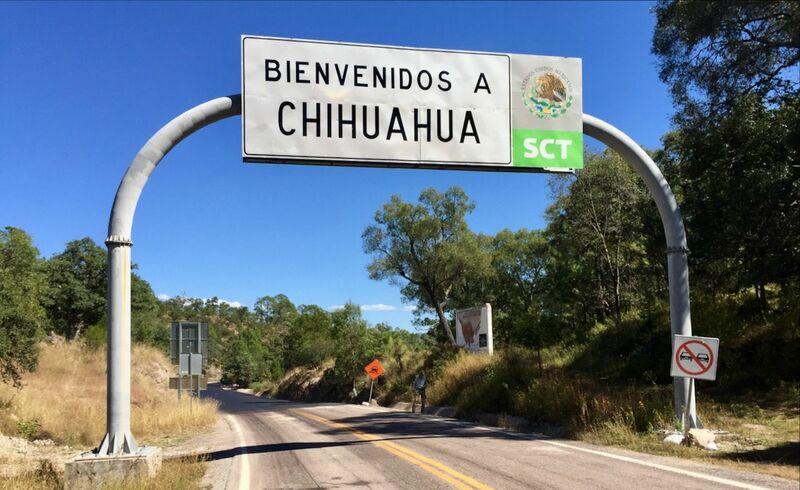 Chihuahua is Mexico’s biggest state. Ciudad Chihuahua (Chihuahua City) is right in the center of the state and is where the convention will be based. Copper Canyon from tha Parque Aventura in Divisadero. Chihuahua is where you’ll find Copper Canyon. Copper Canyon is a magnificent series of 6 spectacular canyons that are a feast for your senses. Copper Canyon is several times bigger than Grand Canyon. Creel is a one of 111 Pueblos Magicos (Magical Towns) in Mexico. It serves as the gateway to Copper Canyon. It’s much like Flagstaff, AZ to Grand Canyon. Creel is home to several indigenous people and a great town, on its own. 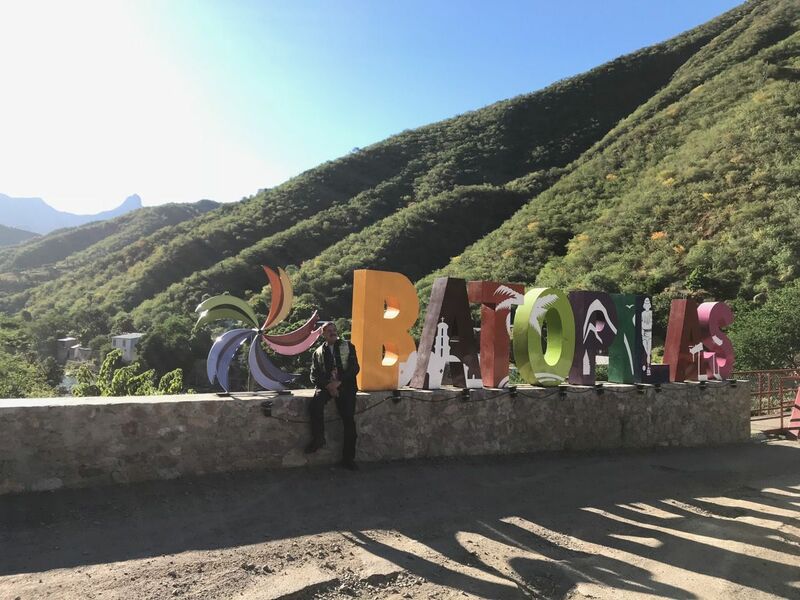 Batopilas is a small mining town on the southeast outskirts of Copper Canyon. This Pueblo Magico shares a rich history, indigenous people, and Mexico’s version of the Stelvio Pass with visitors. The road from Batopilas to Creel is one of the top 6 moto-roads in North America. Basaseachi is home to Mexico’s tallest and second tallest waterfall. It is on the northwest corner of Copper Canyon and well worth the visit. Hidalgo del Parral is situated on the south end of the state. 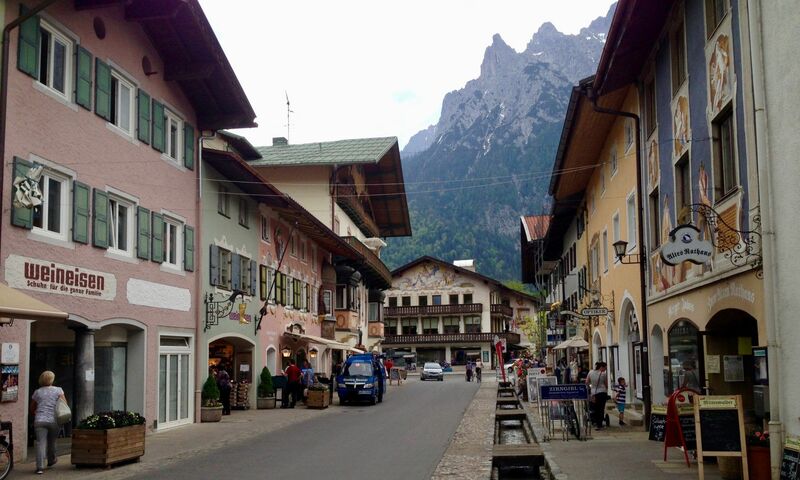 It is a charming and surprisingly walkable town. It has the distinction of being the place Pancho Villa was murdered and initially buried. The town doesn’t cater to tourists but instead offers a completely pleasant town with a vibrant nightlife. 1. Riding to Mexico is the fastest way to include “International Traveler” on your description. The City of Chihuahua is only four hours south of the El Paso Border Crossing and quite easy to get to in half a day. 2. All bikes and brands are welcome. It’s the Motorrad Federation, not the BMW or H-D Club. 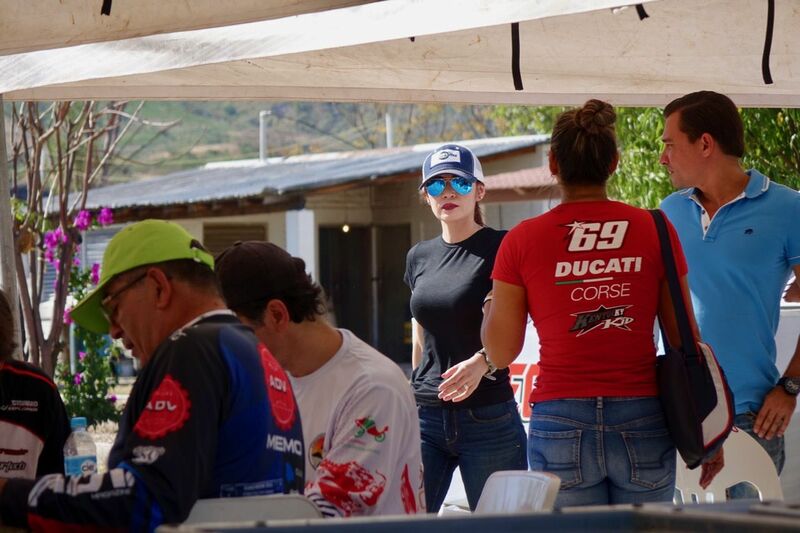 A majority of the big bikes in Mexico happen to be BMW Motorcycles, but Ducati, Honda, Yamaha, and any other brand is welcome. 3. Riding in Mexico is AWESOME. While it’s important to stay alert and vigilant, most other motorists from trucks and buses to cars and cops love riders and think you’re cool! Though in towns, enforcement can be strict, on the backroads and highways, you can ride at your pleasure without worrying about sneaky highway patrol officers trying to increase the state’s revenue. Outside of towns, speed limits and other traffic signs range from mild suggestion to ironic joke. Gustavo Scherenberg and Norma Diaz dance to the music of a live band. The Convention is a celebration of motorcycle riding. Nowhere else do you see such an intense love of the sport. 5. Motorrad Chihuahua is hosting the convention. They are the most prominent local big-bike motorcycle club in Mexico. They are known throughout the country as a club with open arms and a warm spirit. 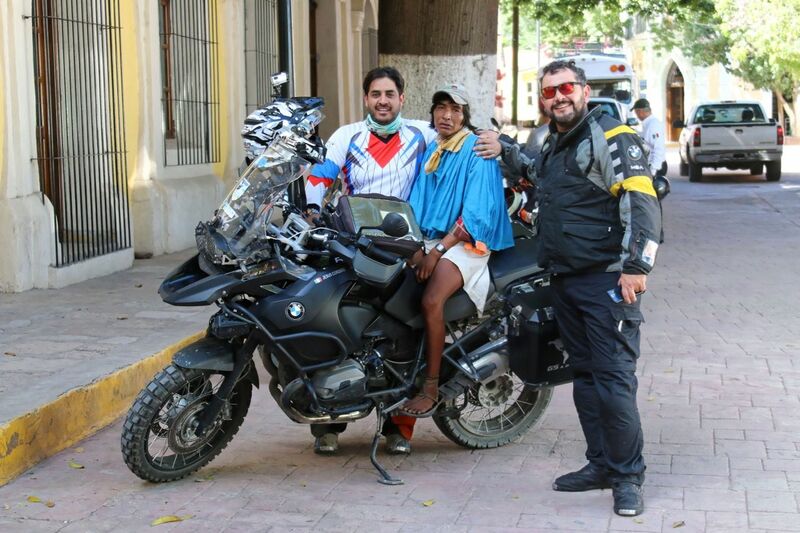 This new BMW R 1200 GS Adventure was given to a participant of the 2016 Convention in Sonora. 6. The International Convention is not a rally like in the US or elsewhere in Mexico. The Convention is not about camping in a park or on fairgrounds. It’s about riding to amazing places during the day and having a great time at night. The Federation is about riding and being good stewards of the road. It’s about community, friendship, and portraying a positive image of motorcycling. It’s also about having a lot of fun. First-time attendees marvel that there is no attitude by other attendees. 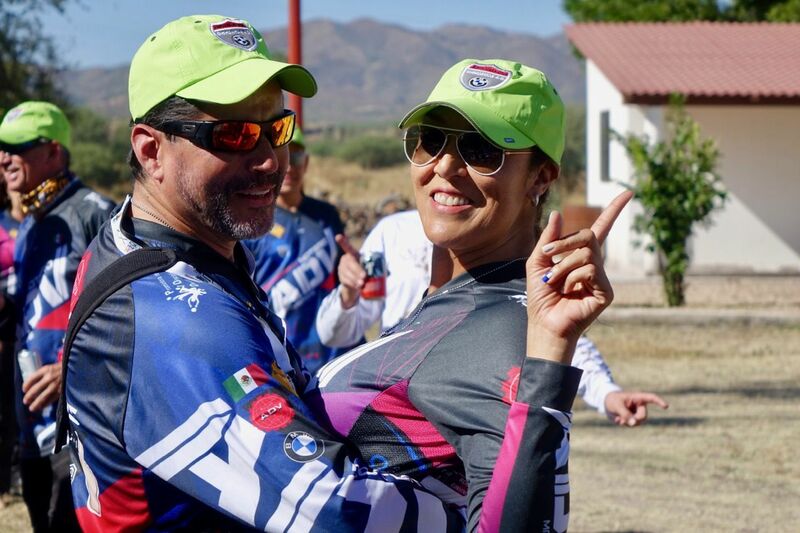 Many Mexican riders bring their wives or partners as active and welcome participants. There are nearly as many women as men in attendance. 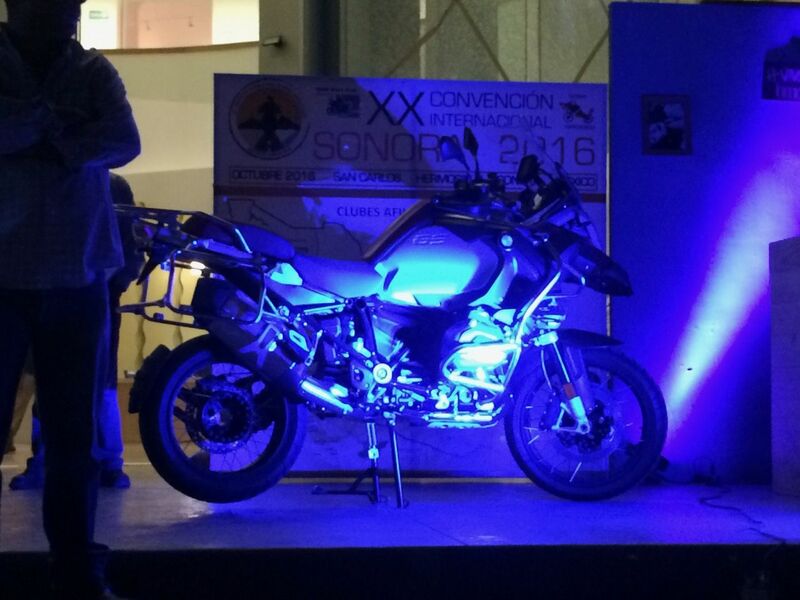 Each convention also gives away a new premium motorcycle. In previous years, it was a BMW R 1200 GS Adventure, or BMW K 1600 B Bagger. The drawing entry is included in the admission cost. There’s no hustling to buy sweepstakes entries. 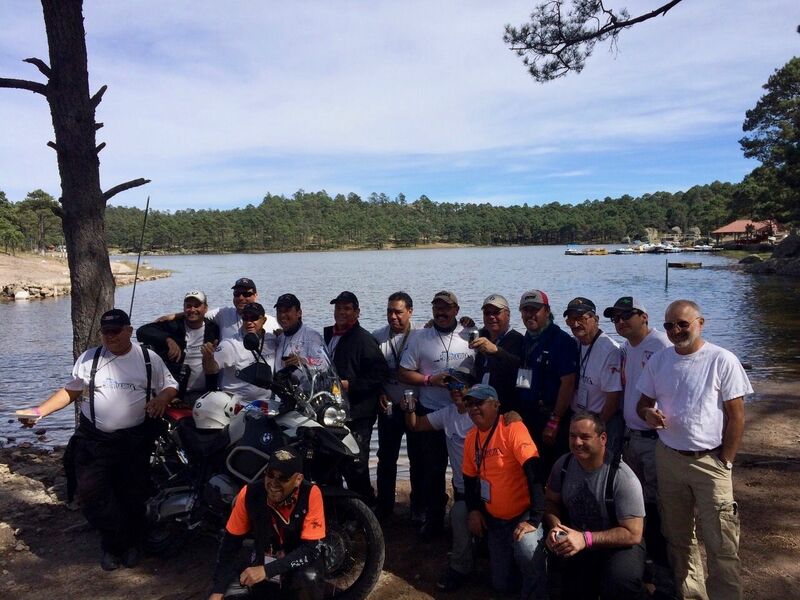 No organization in Mexico does more to welcome motorcycle travelers to Mexico then the Motorrad Federation Mexico. 7. The riding destinations during the convention are incredible since they are chosen by the local club. They include food and drinks along with activities, entertainment, and warm friendship. 8. Chihuahua is a fantastic city! In the center, over 400 years of history are wonderfully displayed. Chihuahua is also very modern with excellent restaurants, well-surfaced highways and a vast amount of awesome places nearby. 9. You’ll meet people who have traveled throughout the world by motorcycle. A conversation will reveal that the person sitting next to you made some incredible achievements by motorcycle. Most of the other Mexican riders speak decent to excellent English and will love to exchange information about rides to Alaska, Canada, the USA, and more. 11. The weather is perfect. Chihuahua City sits at 4600’ elevation. The high elevation means temperatures are much milder in the late summer months. Late September – Early October is a wonderful time to ride through Mexico. 12. You can travel with a group if you’re inexperienced riding in Mexico or if you’re more comfortable riding with others. It’s not difficult to travel solo. It’s advisable that you have previous experience riding with friends or in a group, because of all the requirements and nuances. If you plan on going alone, here is an excellent source of information for first-time travelers to Mexico. Several groups of riders will leave the United States to travel to the convention. Authentic Moto Travels is the Official Travel Company of the XXIII Internacional Convencion – Chihuahua. Depending on how much time you have and how much fun you can handle, decide what’s best for you. There are isolated pockets of problems in Chihuahua, much like California has Oakland, Stockton, and San Bernardino. The places to avoid in Chihuahua, especially at night, include Casas Grandes, The border region south of New Mexico, and Ciudad Juarez. Traveling through Juarez by day, especially on the outside of town at the Socorro crossing, is not a problem. In general, stick to major roads and daylight only travel, and you’ll be fine. Authentic Moto Travels is leading a group of riders to the Chihuahua Convention starting in Late September on a 17 Day PIY Mexico Adventure. 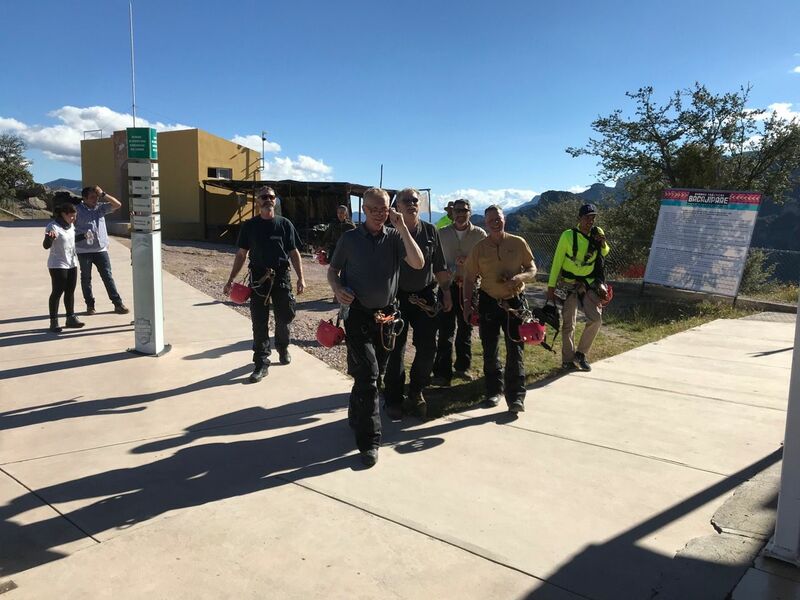 The trip will include four specially designated Pueblos Magicos and three of the Top Six Motorcycle Roads in North America. You’ll get to know and deepen your understanding of Mexico. You’ll also experience the incredibly warm and rich culture throughout the country. Riders will sense differences between the various regions including cuisine, indigenous people, terrain, and scenery. If you have any questions or want further information on the convention in Chihuahua, please contact Jim Foreman. Everyone in Mexico loves motorcycles. Especially children. Women make up a significant number of attendees at the Convention. 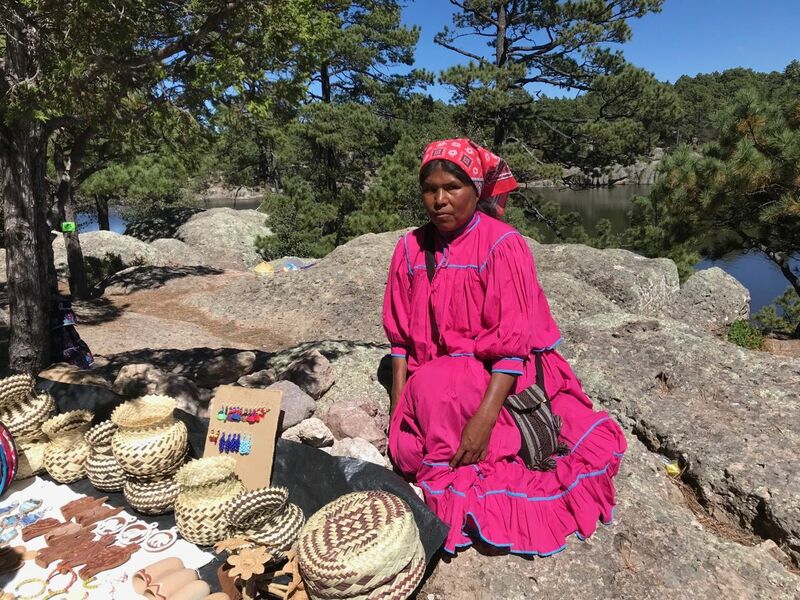 Indigenous woman selling locally crafted items. Thank You Griff. I look forward to meeting in person sooner rather than later. Let me begin by saying what and excellent article! Second, would you happened to know anyone/club in the So Cal (i.e. : Los Angeles, Riverside, San Bernardino, O.C., San Diego, Kern Co.,) and/or Tijuana region that might be doing the pilgrimage to Chihuahua via the U.S. or México side? I’d rather ride in a group, but aren’t afraid to tackle it solo. More than likely if I ride solo, I’ll go via México to Chihuahua to broaden my horizons (literary and figuratively) and pre-live the roads and towns before they get crowded. I’ve already purchased my admission ticket and have the room/board squared away to arrive Sunday, September 30th, before the event kicks off. In other words, I’ll be taking off from Tijuana on Thursday, September 26. Thank you for the very kind comments. You have a couple options. You could join me and the group I’m leading to the convention. Several people from LA are going to ride out to Tucson to drop down at Nogales. Unless you plan to take the ferry from La Paz, I do not recommend crossing until you get to Nogales. Going with me, you’ll be certain to have all the proper paperwork and be able to see wonderful parts of Mexico few get to see.